This first Earth Day was celebrated on April 22, 1970 and was the idea of Senator Gaylord Nelson. He brought the concept up to President Kennedy in 1962, who agreed to tour the country to raise awareness. I find it ironic that the idea for Earth Day-a way to draw attention to the ecology of our very own planet Earth-has been around since before I was born! 10. It's Earth Day! by Mercer Mayer (2008): Little Critter learns about the ice cap melting and polar bears losing their habitat, which gets him motivated to change his habits and invent a climate control machine! 9. Biscuit's Earth Day Celebration by Alyssa Satin Capucilli. (2010) Biscuit and his owner attend a local Earth Day event and learn about many ways to celebrate and clean up our planet. 8. Dinosaurs Go Green! ; A Guide to Protecting Our Planet by Laurie Krasny Brown and Marc Brown (1992, 2009). A lively romp through what every good dino or human should know about reducing, reusing, and recycling so we don't become extinct...Told through easy-to-read panels and speech bubbles. 7. Fancy Nancy; Every Day is Earth Day! by Jane O'Connor (2010). After learning about Earth Day at school, Fancy Nancy brings the message home, but creates a bit of a mess when she goes over the top to teach them. 6. We are Extremely Very Good Recyclers by Lauren Child (2009). Lola discovers how much fun recycling can be with the idea that she can earn a free tree to plant and of course, she gets all her classmates to help! 5. What Planet are You From, Clarice Bean by Lauren Child (2002). When she finds out a neighborhood tree is going to be destroyed, Clarice Bean resolves to become an eco-warrior for Planet Earth. 4. The Earth Book by Todd Parr (2010). 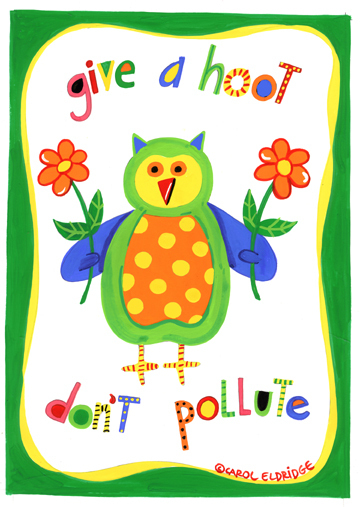 Everyday eco-advice told with his amazing artwork will teach kids to turn off the water while they brush and so much more! 3. Just a Dream by Chris Van Allsburg (1990). One young boy, Walter, doesn't think one hoot about littering and generally messing up the environment until he takes a mysterious journey in his bed. 2. The Lorax by Dr. Seuss (1971). Classic tale of creating a need for thneeds (a useless item for sure) and using up all kinds of valuable resources to create and distribute until our landscape is beyond polluted and drab. A must read for everyone! 1. Arthur Turns Green by Marc Brown (2011). A class project has Arthur turning green and D.W. in a panic when she thinks she might be next!